Singapore’s own Harry’s Bar has finally made its way to Pune, having just opened at ‘Out of the World’ in Lane 7, Koregaon Park. In this new avatar – Harry’s Bar + Kitchen, the focus is somewhat balanced between drinks and food, and there’s something for everyone on their extensive menu! Harry’s is open all-day from 12 Noon to 1AM – we think it’d be an ideal spot for either a work-lunch, brunch with your squad, a romantic date with your partner, or even dinner with your parents. We think there’s enough variety of food on the menu to keep even the fussiest eaters happy, and we ourselves are eager to go back and try some more! The prices are reasonable, and the portions are generous. In case you’re not sure what to order, Harry’s staff are friendly and happy to recommend things to try. There will be live music on Wednesday and Friday nights (starting this week), and more exciting events in the coming months – like mini-food festivals, live sports screenings, Sunday brunches, etc. Harry’s is a 26-year old brand, brought down to Pune by Pogo Hospitality (Hitesh and Karan Bajaj). Their space here has a really mature, chic aesthetic – with comfy seating, plush booths, a gorgeous back-lit bar, mood lighting, and rich tones of emerald-green, turquoise, and warm browns. Two balconies that run parallel to the indoor space offer al-fresco seating options as well. On the drinks menu, are a blend of ‘Harry’s Signatures’ drinks and other classic cocktails (and mocktails) – specially crafted by mixologist Shatbhi Basu. The ‘Praying Lotus’ caught our eye immediately – a concoction of white rum, litchi, guava, pineapple, strawberry, and kaffir lime. Though it sounds sweet, it was light, fragrant, and just the right amount of fruity. Beer aficionados, take heart in the fact that Harry’s imports their Heineken directly from Amsterdam – air-compressed, not carbonated – so it won’t leave you feeling bloated. For teetotalers, we hear their ‘Curry Cucumber’ cooler is a must-try. The food menu here is much more diverse than we imagined it would be – featuring everything from contemporary-Asian cuisine, to Indian favourites, and even a bit of European ‘pub grub’ (burgers, soups, salads, pizzas). 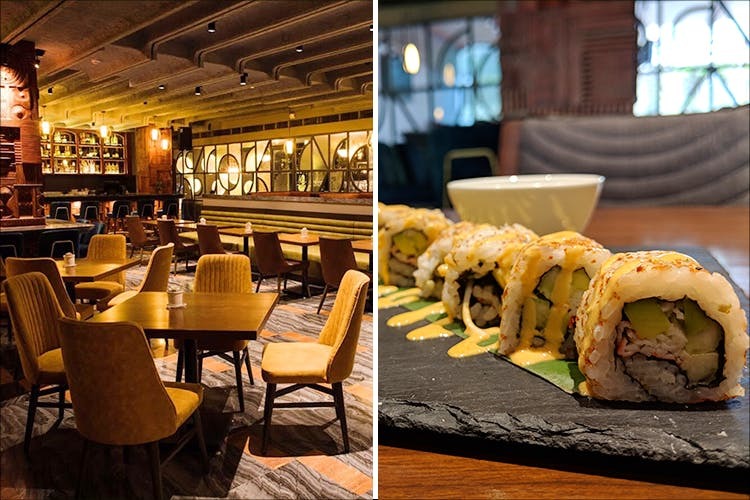 What really piqued our interest, was the fact that Harry’s launched with a special live sushi and dim-sum bar – run by a professionally trained Sushi Chef. So, to begin our meal, we ordered the Californian Crab Maki, and the Prawn Dyna Maki rolls off the sushi menu. Both rolls were made perfectly, and tasted super – though the toasted-sesame-topped prawn tempura roll ended up being our favourite of the two. For the main course, we tried the tom-yum inspired Bangkok Seafood Bowl, and a veggie Burmese Khau Suey – both, with noodles. The former dish included a coconut-milk base, full of tender pieces of fish, prawn, tomato mushroom, chili, and herbs. It was subtle, with undertones of a typical tom-yum sourness that went really well with the sweet meat of the prawns. The Khau Suey was the spicier of the two, served on a hot charcoal stove, with nine types of condiments. Even for a veggie dish, this was quite moreish. Other dishes we think you could try, are the Fondue-Stuffed Mushrooms, Wonton Kachoris, the Malaysian Chicken Satay, Jamaican Jerk Chicken, and the Laksa Bowl. Harry’s lists only five desserts on their menu for now, but we’re told they will be adding more in the future. To end our meal on a sweet note, we tried their ‘Drunken Volcano Cake’ with a molten-chocolate center, served with vanilla ice cream on brownie bits. As indulgent as it was, we really look forward to them adding more desserts to their roster, soon.